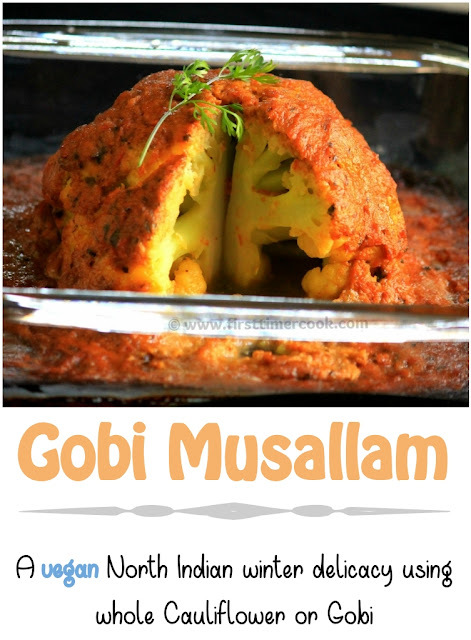 Gobi musallam literally means whole gobi / cauliflower. Basically it is a roasted whole cauliflower dish and much popular dish in northern part of India. Gobi musallam is easy to prepare and eye appealing too. Mainly the whole cauliflower / gobi is first parboiled, a creamy sauce is whipped up, then parboiled gobi is well coated by sauce and roasted in oven. Finally the delicious dish is served in an exotic way. 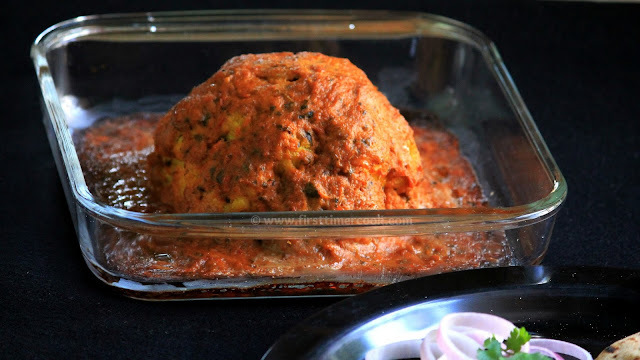 This is a very presentable dish and can make a centerpiece on serving table in any party. 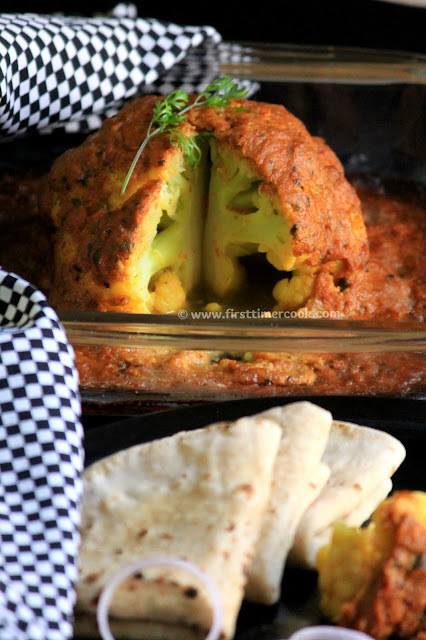 So lets go in details of preparation of this absolutely delicious gobi / cauliflower musallam dish. Remove any outer leaves from the cauliflower head. Then put the cauliflower on a plate facing the stem upwards. Using a knife, cut the extra stem in such a way that cauliflower can sit straight at base facing the florets upwards. Chop coarsely onion, ginger, garlic, tomato separately. Keep aside. Soak the cashews in water. In a pan boil enough water along with salt and turmeric powder. Gently drop the whole head cauliflower (head facing upwards) in the boiling water and boil for 5 minutes. Then flip it (head facing downwards) and again boil for 5 minutes. Strain the cauliflower and keep aside. In another pan, heat oil on medium heat. Add the coarsely chopped onion, garlic, ginger and sauté for 5 minutes till onion turns transparent. Next add coarsely chopped tomato and all spice powder except kasoori methi. Cook until tomato turns soft. Turn off the heat and let the masala mixture cool completely. Then blend the cooled masala mixture along with soaked cashews until smooth paste in a blender. Pour this paste into the same pan and cook again on medium heat for 5-10 minutes. Add little water if the sauce gets too thick. Now add kasoori methi, stir well and cook for another 5 minutes. 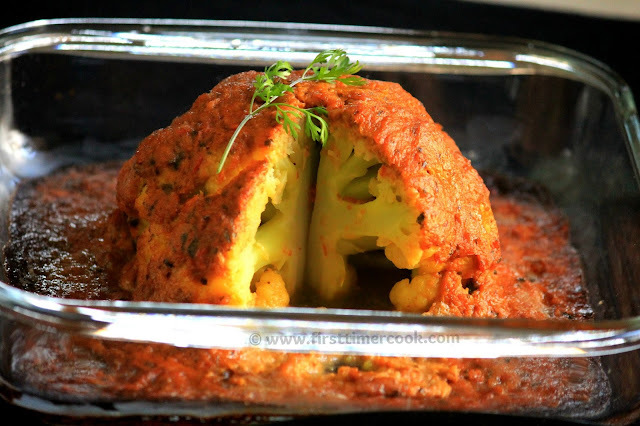 In the meanwhile, preheat oven to 200 deg C.
Put the cauliflower (head facing upwards) in a baking dish and pour the masala over the cauliflower and ensure that the whole cauliflower is well coated. Bake for 30 minutes and by the time the cauliflower starts to brown. Garnish with coriander leaves, slice and serve along with roti / naan ! The most important point here is to select a worm free cauliflower since the cauliflower is used as a whole. This must be so aromatic. I love baked cauliflower. I must try your recipe soon.